What personally identifiable information www.LessonsWithTroy.com collects. How www.LessonsWithTroy.com uses the information. With whom www.LessonsWithTroy.com may share user information. What measures www.LessonsWithTroy.com takes to protect the information under its control. If you have questions or concerns regarding this statement, you should first contact the Security Department, by emailing us at Troy@LessonsWithTroy.com. This program covers only information that is collected through this Web site, and does not cover information that may be collected through software downloaded from the site. You have the option to provide demographic information (such as age, musical interests and gender to us; we encourage you to submit this information so we can provide you a more personalized experience on our site. www.LessonsWithTroy.com is the sole owner of the information collected on www.LessonsWithTroy.com. www.LessonsWithTroy.com collects personally identifiable information from our users at several different points on our Web site. We may use a third party service provider to conduct these surveys or contests; that company is prohibited from using our users� personally identifiable information for any other purpose. We will not share the personally identifiable information you provide through a contest or survey with other third parties unless we give you prior notice and choice. If you choose to use our referral service to tell a friend about our site, we will ask you for your friend�s name and email address. We will automatically send your friend a one-time email inviting him or her to visit the site. www.LessonsWithTroy.com stores this information for the sole purpose of sending this email and tracking the success of our referral program(s). Your friend may contact us at Troy@LessonsWithTroy.com to request that we remove this information from our database. 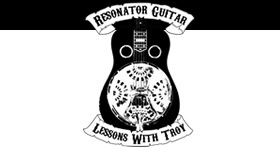 www.LessonsWithTroy.com provides music instruction. Our approach to matching students and teachers in order to provide the best possible learning experience for the user is integral to the success of our students. The information we collect allows www.LessonsWithTroy.com to improve the lessons and content provided to the user on an ongoing basis. Special Offers and Updates We will occasionally send you information on products, services, special deals, and promotions. You can sign up for these emails from us on our registration page. We store information that we collect through cookies, log files, clear gifs, and/or third party sources to create a �profile� of your preferences. We tie your personally identifiable information, and your purchasing history, to information in the profile, in order to provide tailored promotions and marketing offers and to improve the content of the site for you. We DO NOT Share Personally Identifiable Information with Third Parties We may use an outside shipping company to fulfill orders, and a credit card processing company to bill you for goods and services. These companies are not authorized by us to retain, share, store or use personally identifiable information for any other purposes. We may use third parties to provide other services on our site. We provide you the opportunity to �opt-out� of having your personally identifiable information used for certain purposes, when we ask for this information. For example, if you purchase a product/service but do not wish to receive any additional marketing material from us, you can indicate your preference on our order form. If you no longer wish to receive our newsletter and promotional communications, you may opt-out of receiving them by following the instructions included in each newsletter or communication or by emailing us at Troy@LessonsWithTroy.com. We may use this information, which does not identify individual users, to analyze trends, to administer the site, to track users� movements around the site and to gather demographic information about our user base as a whole. We may link this automatically collected data to personally identifiable information for the purpose of enhancing your experience on the site and to assist us in marketing more effectively. We may use both session ID cookies and persistent cookies. We may use session cookies to make it easier for you to navigate our site. A session ID cookie expires when you close you browser. A persistent cookie remains on your hard drive for an extended period of time. You can remove persistent cookies by following directions provided in your Internet browser�s �help� file. Cookies will be used to identify you , track your progress, update your profile and to create a personalized user experience. We set a persistent cookie to store your passwords, so you don�t have to enter it more than once. Persistent cookies also enable us to track and target the interests of our users to enhance the experience on our site. If you reject cookies, you may still use our site, but your ability to use some areas of our site, such as contests or surveys, will be limited. www.LessonsWithTroy.com will not be able to track your progress, as well. We may employ [or a third party advertising partner may employs] a software technology called clear gifs (a.k.a. Web Beacons/Web Bugs), that help us better manage content on our site by informing us what content is effective. Such devices are tiny graphics with a unique identifier, similar in function to cookies, and are used to track the online movements of Web users. In contrast to cookies, which are stored on a user�s computer hard drive, clear gifs are embedded invisibly on Web pages and are about the size of the period at the end of this sentence. We may tie the information gathered by clear gifs to our customers� personally identifiable information for more efficient use of our sites. We may use clear gifs in our HTML-based emails to let us know which emails have been opened by recipients. This allows us to gauge the effectiveness of certain communications and the effectiveness of our marketing campaigns. If you would like to opt-out of these emails, please contact us at Troy@LessonsWithTroy.com. This Web site contains links to other sites that are not owned or controlled by www.LessonsWithTroy.com. Please be aware that we, www.LessonsWithTroy.com, are not responsible for the privacy practices of such other sites. If your personally identifiable information changes, or if you no longer desire our service, you may update, delete or deactivate it by making the change on our account management page or by emailing our Customer Support at support@workshoplive.com or by contacting us by telephone or postal mail at the contact information listed below. The security of your personal information is important to us. When you enter sensitive information (such as credit card number) on our registration or order forms, we encrypt that information using secure technology. To learn more about our procedures, contact us at Troy@LessonsWithTroy.com. If you have any questions about security on our Web site, you can send email us at Troy@LessonsWithTroy.com. In the event www.LessonsWithTroy.com goes through a business transition, such as a merger, acquisition by another company, or sale of all or a portion of its assets, your personally identifiable information will likely be among the assets transferred. You will be notified via prominent notice on our Web site for 30 days of any such change in ownership or control of your personal information.